If exchanging gifts is part of your holiday traditions, you know choosing the perfect present can be a real challenge. Gifting to someone who loves to travel can be tricky because often they’re minimalist and don’t want more stuff or very practical and picky about the things they actually use. If you have a nomadic loved one and you’ve stumbled on my blog in a desperate search for gift ideas, you’re in the right place! If you’re one such nomad, share this post widely — your family will thank you. If you have an idea of what they like, look for these tags to help identify gift categories. 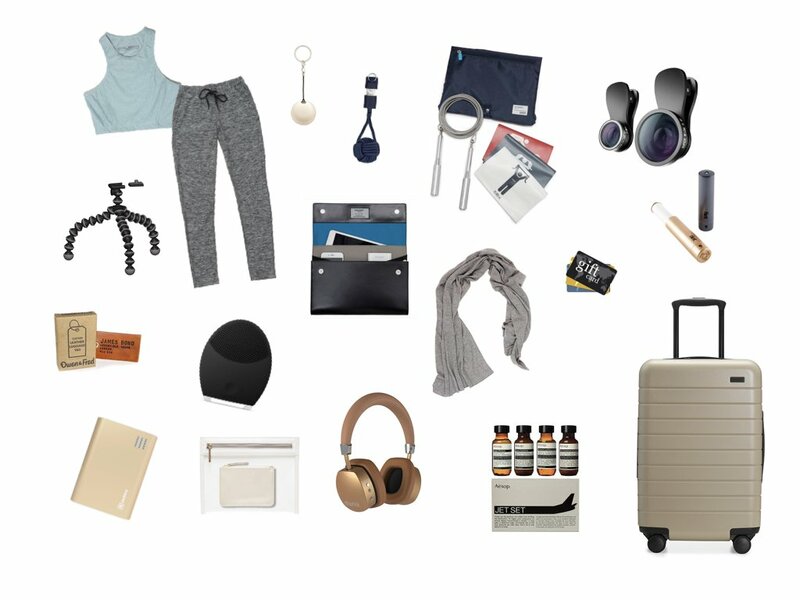 Fashion, Tech, Travel, and Beauty. Outdoor Voices is one of the hottest brands for athletic/athleisure clothing right now. Based out of NYC, they make sleek and fun clothing that’s high-performance without the bright, flashy, or “inspirational” designs of many brands. Get $20 off your purchase of $100+. This simple and elegant keychain can be a lifesaver. Attach it to anything: purse, backpack, camera, wallet, keys, and locate them using your phone. Very useful if you’re travelling and misplaced something. Your phone can help you track it down at the last café you visited. As an alternative, you can also grab the popular Tile on sale. They come in packs, so you can keep one for yourself. Likewise, this keychain means you always have a charging cable on you. It’s very pretty and different from having a jumbled cable in your bag. This kit with a pouch, skipping rope, and elastics is perfect for the health-conscious nomad. A really fun stocking stuffer that transforms your iPhone photos. Not the greatest quality in photography equipment, but very fun to test out different effects. The chicest lint roller you’ll ever see, the Flint is a retractable, compact, and refillable lint roller. Great stocking stuffer and comes in many colours. This is a classic gift for just about anybody. A cashmere scarf is timeless, luxurious, and practical. On flights, it doubles as a cozy blanket. This leather clutch is so much more than meets the eye. It’s an organizer that keeps everything within reach in a smart way. A place for everything and everything in its place. The iPhone photographers will love this. It wraps around anything and keeps your phone secure. It doubles as a selfie stick and comes with a remote control. A classic and personal gift, monogrammed travel accessories are a sure winner. There are loads of custom luggage tags manufacturers online, for any price point, so shop around! This is a very popular beauty product right now. It’s the same concept as most facial brushes, promising cleansing, improved circulation, and anti-aging. The bonus is this one doesn’t need a new head every three months and is more hygienic. Travellers always need more juice for their devices on the road. Give them a pretty (and high-performance) backup battery in a metallic finish. A favourite in Instagram flatlays, the Truffle pouches are great for makeup, travel documents, and cables. Headphones are a product that your loved one will take with them everywhere: on the plane, while commuting, and while editing their travel videos. This is a great gift and there are lots of options for price and style. This luxe beauty company is a favourite among bloggers. Any travel-sized mini of a beloved brand is a great gift. Aveda, Sephora, and Ulta offer loads of options for mini versions of beauty cult faves. The latest in luggage technology, the Away suitcases have it all. Locks, durability, great wheels, smart organizers inside, and a USB charging battery built right in! Get $20 off your purchase. Give your traveling friend or family member the VIP experience with a membership to Priority Pass airport lounges. The network grants access to 1000 airport lounges around the world. It’ll make their trips that much better. For the person who has everything, why not make their next stay on you? AirBnB gift cards never expire! Do you know what their most frequently-traveled airline is? Why not cover a portion of their next flight? Isn’t spending time together the greatest gift? Granted, this isn’t the perfect idea for everyone because a lot of it depends on how close you are and the love languages at play. However, if you think it would be well-received, why not propose spending some quality time with your loved one and sharing a memorable trip. Awesome suggestions as always!! That lint roller tho.